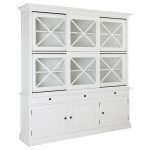 The Frejac Buffet Hutch is Hamptons heaven, casual yet sophisticated. Featuring two tiers of three sliding glass doors, perfect for displaying your finest pieces. The piece also incorporates solid drawers and cupboards for keeping all you need for dining and entertaining in style in beautiful hand-finished mahogany.